PPU ERGOPOL Sp. z o.o. (ERGOPOL Ltd production & services) with its head office in Katowice, was founded in 1988 as a company with a multiple specialization. The company has well qualified technical staff which gained its experience by participating in the realization of numerous serious contracts according to requirements and European standards (FIDIC). 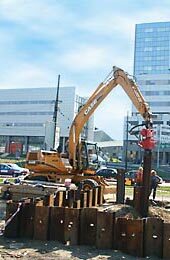 Thanks to the employment of high class specialists and constant development of equipment base (which includes machines and equipment of renowned companies like CASE, HIAB, VOLVO, TERRA, ATLAS COPCO, ROTHENBERGER, MÜLLER) we can realize huge investment projects. Our potential, long-term experience in the branch and efficient organization of work can guarantee quick and solid realization of each job taken by the company. Technical and economical reliability has been proved by high estimates of the investors.